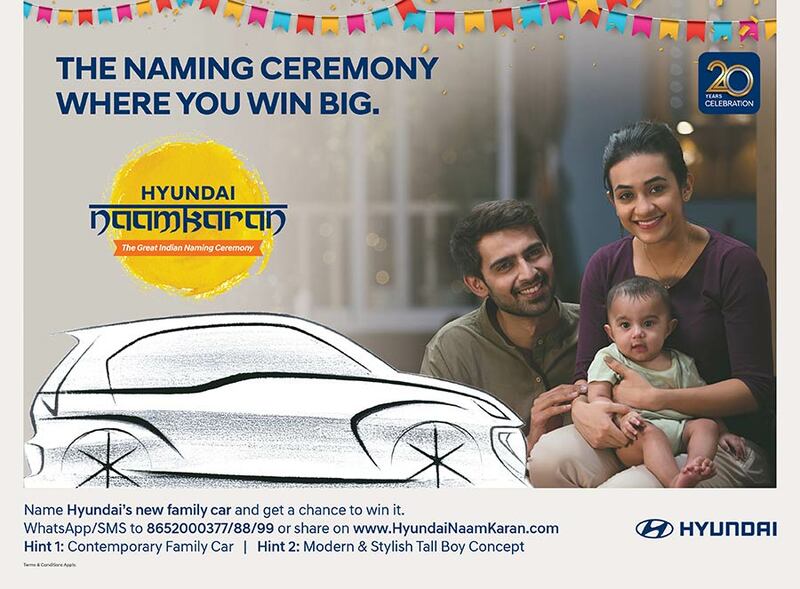 Hyundai Motor India Ltd. (HMIL), India’s second largest car manufacturer and the largest exporter since inception launched The Mega Naming Campaign – ‘Naamkaran’ of the most awaited Contemporary Family Car code named AH2. The World Premiere of the Most Awaited Contemporary Family Car is Scheduled this Festive Season. During the campaign Hyundai will be inviting name suggestions for the New Contemporary Family Car from customers. The participants can suggest the name for their favourite car through Website, WhatsApp & SMS and get a chance to win the new car at the launch. One can visit Hyundai’s microsite www.hyundainaamkaran.com to cast their name choice for the upcoming Hyundai AH2 car. The car is expected to contain the name “Santro” in it.